rec. 2006-2015, Algutsrum kyrka, Öland, Sweden. This is a highly entertaining – but also pretty weird – disc! Musical expressions of madness, delusion, and general strangeness. 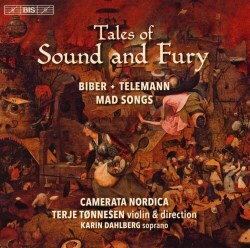 It is the brainchild of Terje Tønnesen, the director and principal violinist of this brilliant group, Camerata Nordica, and his co-conspirator Mikhel Kerem, who doubles as narrator in various items. Warning: these are not ‘straight’ performances. These already quirky works are filtered through the fevered imagination of Tønnesen and co., and very surreal it all is. That extraordinary and wildly original composer Heinrich Biber is well represented, and there are also items from Eccles, Purcell and Telemann. The pieces are separated by frenetic drum rolls from various parts of Europe, giving the experience a faint, odd echo of Stravinsky’s Petrushka, of all things! The first piece is a setting for solo soprano and strings of New Mad Tom of Bedlam, which is an example of a ‘broadside ballad’. These were verses (often bawdy) printed on sheets and sold in pubs during the 17th and 18th centuries. It is compellingly sung by the soprano Karin Dahlberg, accompanied by, apparently, an orchestra of lunatics. Then comes the first Biber piece, the Sonata Jucunda (‘Joking Sonata’). Three Hungarian folk musicians playing traditional instruments have been injected into this alongside the strings and continuo, as have some sly references for modern ears, such as the ‘Topogo’ from Bartók’s Romanian Folk-Dances. That’s followed (after the next drum-roll) by what is probably the best-known music on the CD – Biber’s Battalia, with its extraordinary array of ‘special effects’. There is a March underpinned by a double bass instructed to play with a sheet of music under the strings to imitate a snare drum. And strangest of all, a movement entitled ‘The dissolute company of all types of humour’, in which various songs from different countries – sung by drunken soldiers - and in many different keys are jammed chaotically together. If you’ve heard this before, it won’t have been anything like what Camerata Nordica do with it. You might be forgiven for thinking, at times, that your home has been invaded by Zombies. John Eccles’ song Restless in Thought, again superbly performed by Karin Dahlberg, is an almost Monteverdian vocal fantasy. Then it’s to Biber again, and his famous Sonata Representativa, in which various bird and animals are presented and imitated (plus, confusingly, um….. a Musketeer). This is hilarious and made all the more so by Mihkel Kerem’s deadpan, minimalist introductions. I particularly enjoyed ‘A cuckoo with a diagnosis’ that flies ‘straight into a tree’. This priceless nonsense would make a welcome change to Carnival of the Animals. Much funnier too – the hen coop with a fox running amok amongst the chickens is a great musical masterpiece. After a final splendid drum roll improvisation, we have the most musically satisfying item on the whole of this disc; Telemann’s Don Quixote music, for which the word ‘quixotic’ might have been coined. Once again, you will never have heard this as it is presented here. I love this approach to Baroque music – irreverent, impetuous, but also stylish and witty. This is one of the most intensely enjoyable CDs I’ve heard in months; get it and enjoy!